Since New Year, I have launched two new Search Engine Optimisation apps for iPhone and iPad, along with an update for my well established "Website SEO Checks" app. Along with "CMS Detect", which launched in December 2011, the latest launches mean that I now have a significant showing in Search Marketing apps within the Apple AppStore. 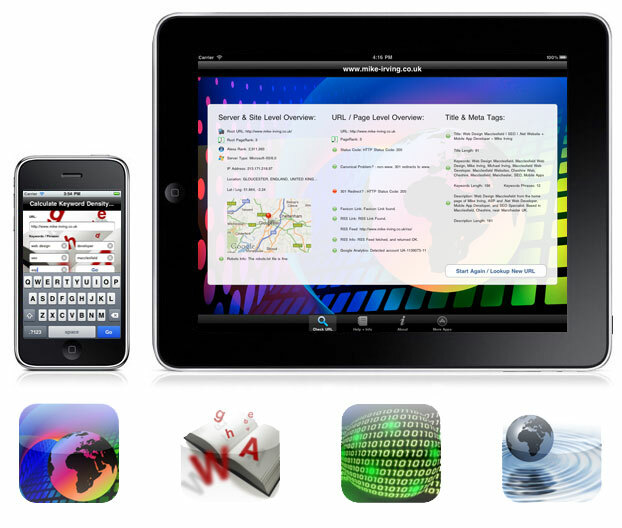 The apps have proved very popular with webmasters and the SEO community. - More info on Keyword Density - iOS App. SEO URL Ping, which became available for download today, allows Website / Blog content authors to submit their fresh content to Search Engines and Blog Aggregation Services. - More info on SEO URL Ping - iOS App. The Flagship Website SEO Checks now looks up "Alexa Rank", amongst the growing list of statistics it reports. - More info on Website SEO Checks - iOS App. Amongst my next projects, I may be making a return to Games Development... details to follow soon.